(Leah Hogsten | Tribune file photo) Rob Bishop, representing Utah's 1st Congressional District delivers his re-election speech at the Utah Republican Nominating Convention, April 21, 2018, at the Maverik Center in West Valley City. In the first campaign report of 2019, Bishop revealed he has raised zero dollars so far this year. Washington • Rep. Rob Bishop, who has said he won’t run for another term, raised no campaign money in the last three months. Freshman Rep. Ben McAdams hauled in north of $300,000. On the other side of the Capitol, Sen. Mitt Romney paid a handsome six-figure sum to his now chief of staff the day before he was sworn into office, new disclosures show. Romney’s campaign paid Matt Waldrip, who previously led business development at the hedge fund Solamere and now runs the Utah Republican’s office, $225,000 on Jan. 2, just before Romney joined the Senate, according to a filing with the Federal Election Commission. “This payment was part of Matt’s compensation package from the campaign,” said Beth Myers, a longtime Romney aide. Waldrip’s firm, MJW Consulting, had only been paid about $12,000 during the 2018 campaign, records show. His firm nabbed $616,000 during the 2016 election cycle from Romney’s former presidential campaign, though Romney was not an active candidate for office. The FEC allows people to raise money even if they are not current candidates, as long as they may potentially be so. There are FEC guidelines on how campaign funds can be distributed for past campaign debts. And it is not unusual that payments are settled after the campaign is over. 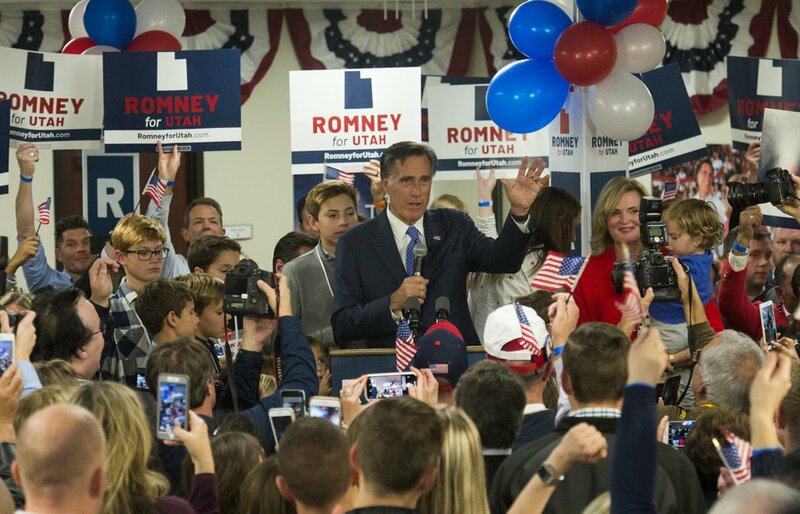 (Rick Egan | Tribune file photo) Mitt Romney gives his victory speech, at the Romney Headquarters, in Orem, on election night, Tuesday, Nov. 6, 2018. Romney’s camp also spent about $15,000 on legal fees to the firm Caplin & Drysdale and $17,000 to a campaign consultant. Romney’s insurance bill? About $27,000. And he paid nearly $1,000 for new Senate stationery. The freshman senator — the 2012 GOP presidential nominee who moved to Utah shortly after losing the general election to President Barack Obama — has been on a spending binge, records show, as he paid off campaign costs from last year. He raised $15,450 in the first quarter of the year but spent $238,655. He has $34,616 in his campaign account. Bishop, who promised in his last campaign he wouldn’t run for Congress again and is rumored to be considering a gubernatorial bid, didn’t raise a dime this year and is sitting on $324,573 in the bank. Should he run for a state office in Utah, he could transfer that money over to a new campaign account. Bishop's campaign transferred $10,000 to the National Republican Congressional Committee. The congressman said Tuesday that he's abiding by FEC rules that he can't rake in money for a race he's not yet in. He's hedging his bets, he said. “You can’t take that as an absolute” that he won’t run again, he said. McAdams, the only Democrat in Utah’s delegation, pulled in about $310,000 in the first three months of the year, continuing an aggressive campaign effort for a district that is majority Republican. McAdams beat then-Rep. Mia Love, R-Utah, with one of the nation’s smallest margins of victory in the 2018 midterms. 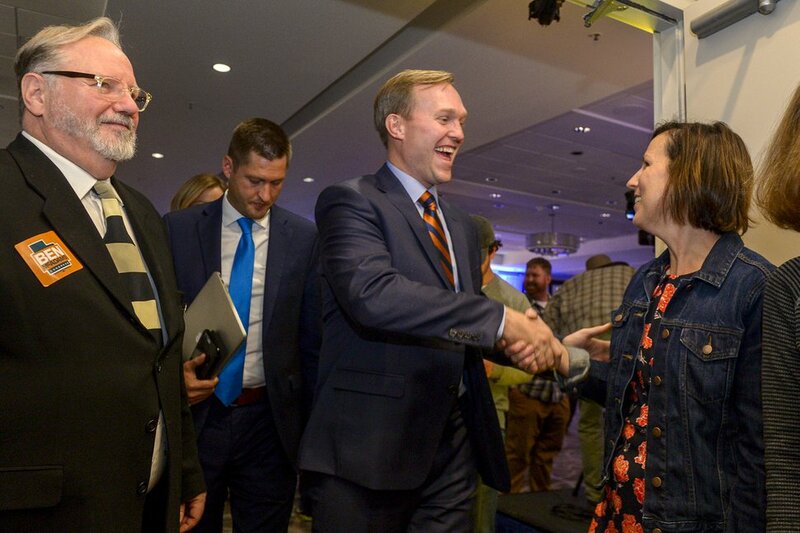 (Leah Hogsten | Tribune file photo) Utah's 4th Congressional District Democratic challenger, Salt Lake County Mayor Ben McAdams is congratulated on a race too close to call at the Utah Democratic election night headquarters at the Radisson Hotel Salt Lake City, Tuesday, Nov. 6, 2018. After two weeks of counting, McAdams was declared the winner over Republican Rep. Mia Love. “The outpouring of support for Ben’s re-election is a testament to the incredible work he’s done during his first 100 days in Washington,” Andrew Roberts, his campaign manager, said. Roberts pointed to the Democrat’s balanced budget amendment plan and his support of health care insurance that covers pre-existing conditions. Sen. Mike Lee, a Utah Republican who is up for re-election in 2022, took in more than $145,000 and spent $82,000. In total, Lee has some $305,000 in his campaign account. Rep. Chris Stewart, R-Utah, raised $68,500 for his re-election and spent nearly $67,000. He has $148,000 cash on hand. And Rep. John Curtis, R-Utah, grabbed about $66,000 from donors and forked over $39,000 in expenses. He has nearly $191,000 in his account.